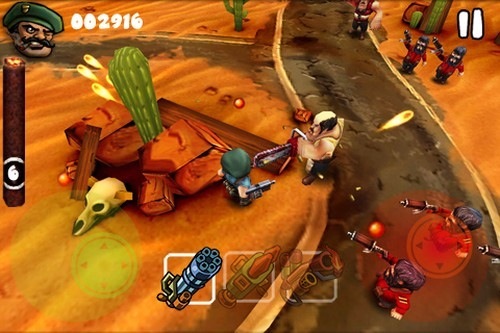 Guerrilla Bob brings plenty of twin-stick action to the iPhone. Usually, when you hear about a guerrilla or a soldier, they have a "tough" name, along the lines of Rambo or Arnold. Not once have we run into a guy called Bob, but that's the name of the hero in Chillingo's latest iPhone game, Guerrilla Bob. He's a gun-carrying soldier wronged by his partner John Gore. So, he goes on a bloodthirsty hunt for revenge, killing anyone that gets in his way. 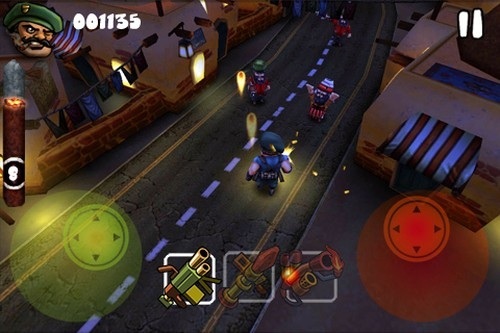 Guerrilla Bob runs through seven locations throughout his journey, occasionally squaring off against bosses who take a lot more damage than the common grunt. Fortunately, Bob has access to a number of weapons over the course of the game, including the helpful flamethrower (where bad guys turn into flaming piles of ash) and a rocket launcher. There are bonus items as well, including power-ups, secret areas to access and plenty of score-boosting cash. The game utilizes an on-screen twin-stick mechanism, with one controlling your movement and the other your direction of fire. While you'll need a few minutes to adjust to sliding your thumbs along the corners of the screen, it's great once you get into it. The game also has different modes, including Easy, Hard and a few tougher ones (that you must unlock), so you can step up (or down) depending on how quickly you're adapting. Chillingo and Angry Mob Games outdid themselves with the game's visuals. The character design is humorous and innovative, with a mixture of strange mobster rejects (bald headed dudes with chainsaws and barrels) and leftovers from Chillingo's previous hit, Minigore. The several locales are equally impressive, ranging from a city resembling Mos Eisley from Star Wars to a trouble-filled canyon, where bad guys pop out of tents like clockwork. In addition, the top-down perspective serves this game well, allowing you to see what enemies are coming so you can prepare by choosing the right weapon for the job. The frame rate is also smooth, despite the fact that the screen constantly fills up with gunfire. That said, the audio comes up short. The few tunes are nothing special, and the sound effects grow repetitive, with the same gunfire effects. The only break from all this monotony comes from the in-game voicework, with Bob shouting verbal threats. Some of them are funny, but there are a few that wear out their welcome. While Guerrilla Bob's Campaign mode is entertaining, you'll plow through it in a couple of hours. Fortunately, there's replay value to spare thanks to two great extras. The first, Survival Mode, hurls enemies of all sorts at you with various difficulty settings. The second is the implementation of Crystal. It's an online system similar to OpenFeint, where you connect to other users through leaderboards to see who has the higher score. Finally, there are Achievements available, which you can share with others. However, it would've been nice for Chillingo to include a co-op mode. For the introductory price of $2.99, Guerrilla Bob can't be beat. It's a fun traditional action game along the lines of Smash TV and Minigore, and what it lacks in a strong Campaign Mode, it makes up for with the awesome Survival Mode and Crystal connectivity. Besides, the guy's name is Bob, and anyone named Bob is cool. What's Hot: Impressive visuals, gameplay is on the same level as other quality shooters, you can share scores and achievements through an online Crystal system, addictive Survival Mode. What's Not: Average sound (outside of some humorous voice quips), no two-player co-op, Campaign mode is over in a couple of hours.